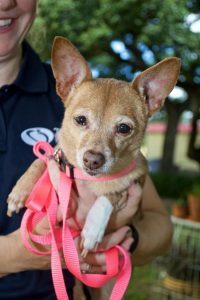 Every day, the Texas Veterinary Medical Foundation is called upon to do more for Texas animals. For animals, the care that they receive through the Rusk Veterinary Assistance Grants or the TVMF PALS Program allows them to remain happy, healthy, and in their homes. With a one-time gift of $100, you will provide an annual exam, vaccines, and one year of heartworm and flea preventative for a pet enrolled in the TVMF PALS Program. $250 provides a dental for one cat or dog, ensuring that they can continue to eat pain free; and $500 helps offset the cost of emergency care for an animal in need of a Rusk Veterinary Assistance Grant. These programs provide much more than a financial solution — they lift the emotional burden, the constant worry that elderly, disabled or disadvantaged people have when they know their pets need care they cannot provide. By sponsoring a pet, you will directly impact the life of a pet who may have otherwise been surrendered due to a lack of funds.